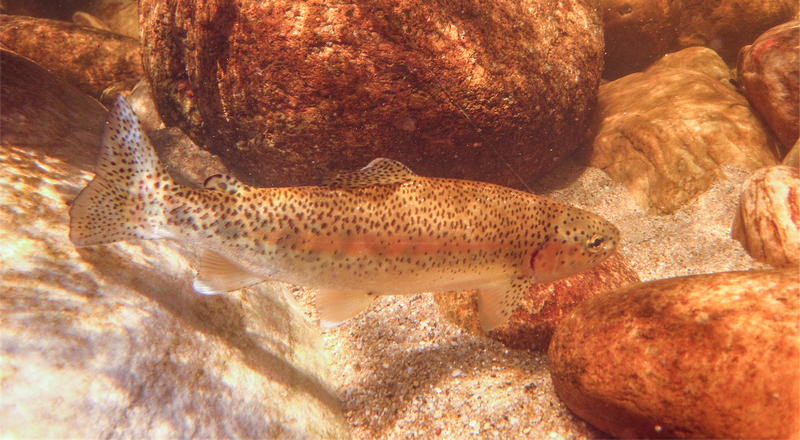 While this should mean well conditioned (and fairly fat) from our streams, it also has meant high water levels at a temperature that makes wading deeper that mid-thigh a rather uncomfortable proposition. Yes, waders could be used but we rather break them for the streams, especially considering the blue skies and warm sun. Ryan, prospecting the side eddies under a banner of blue sky and steep cliffs. The day made a frustration start when we arrived at the Stettynskloof gate. Access to the kloof is restricted and entry is via a gate that is opened by a phone call. Problem was it didn't seem to be working all that well this weekend. The phone rand once and went dead. The gate remained resolutely closed and we were forced to make alternate arrangements! Luckily good friend and longtime fishing partner Ryan Weaver had an ace up his sleeve. He made a quick phone call and got us access to the Suzman's beat on Smalblaar River. 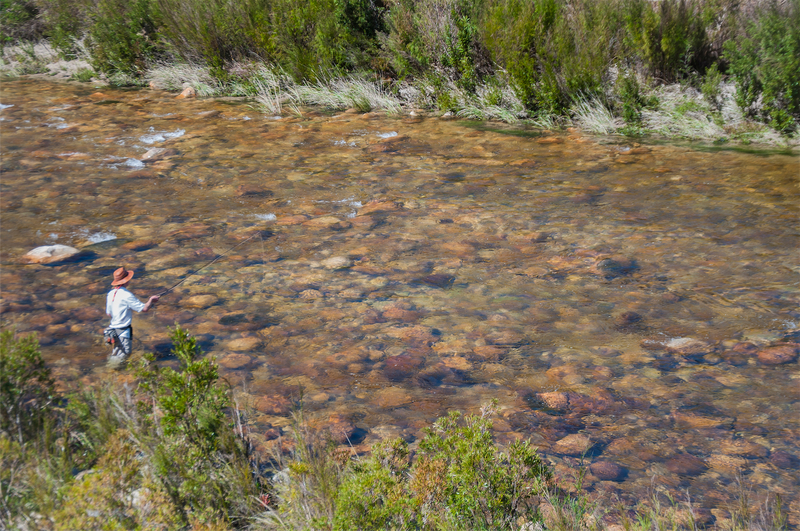 The nearby Smalblaar river is steeped in Western Cape fly fishing lore and most be one of the most pleasant dryfly streams anybody could wish to fish. The particular stretch of water that we were fishing is not generally open to the public. Sometimes the Society are given access on special occasions but normally anyone fishing it without permission from the owners should not be there. So I was smiling! The water was high and fast but still very fishable. Ryan went nymph, I decided dry which considering the high, cold water was a risk. But I just LOVE fishing a dry and was rewarded fairly early on with a beautiful rainbow. Things slowed down dramatically until Ryan I got smashed by what we think was one of the big browns that have been hanging around since they escaped into the river from a hatchery about four years ago. They're mean and awesome to catch. But this one had other ideas and made short of the 5x tippet attaching Little Green Grub to my bushy dry. Ryan soon had a Green Grub on and the day got a bit better in terms of fish interest. 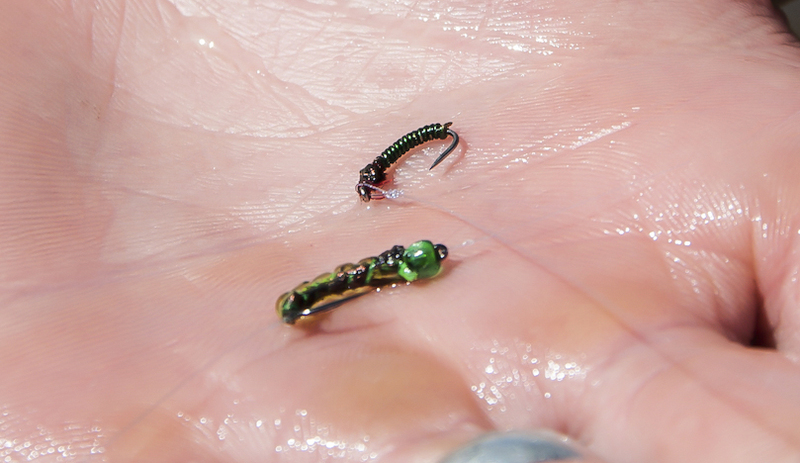 The Little Green Grub is strangely under utilised by the Cape fly fishers. I think it has a lot to do the fact that many of us are so conditioned to using dry that nymphing becomes a GRHE or PTN tunnel-visioned exercise for many! But as one of the few regularly occurring non-terrestial food sources, its a damn effective fly. We fished slowly and did our best best to avoid water that meant wetting our nether regions. It was a lazy day of day of fishing but a great start to the season. It is such a stunning area to fish that one cannot but help finding themselves mesmerised by the grandeur of the kloof.